J.H. Palmer joins our November 5th lineup! In latebreaking news, we're pleased to announce that Tuesday Funk veteran J.H. Palmer will join our November 5th program, replacing Joseph "Joe the Cop" O'Sullivan, who was caught in a scheduling conflict. Joe will be back at a future date, but we're delighted to welcome Jessica, who joins our already stellar lineup of Paul McComas & Greg Starrett, Vojislav Pejović, Rosamund Lannin, and John Rich. 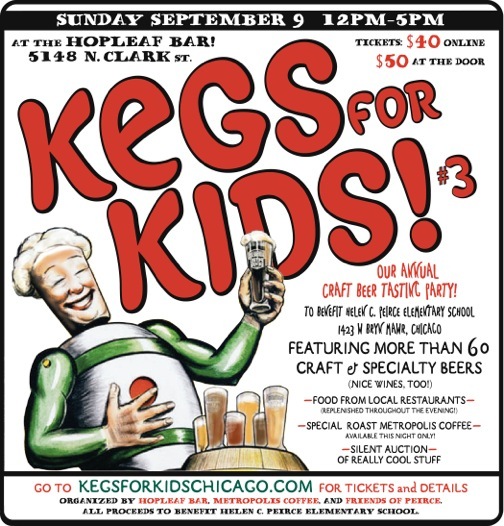 Be there, upstairs at Hopleaf, 7:30 pm! A little snow won't stop us! Listen up, Funkers! Lest we've been unclear, let me break it down for you. We are not canceling Tuesday Funk tonight because of a little snow. Repeat, Tuesday Funk is on, baby. Bring it. Watch this space for more on Rob and all our upcoming readers, and be sure to join us upstairs at Hopleaf on April 5th, 7:30 pm! You'll be glad you did. Hi, everyone. My name is William Shunn, and I'm one of the new co-producers of Tuesday Funk. If you're reading this, you've probably already noticed our spiffy new web site. I'd like to tell you about some of the other changes afoot. 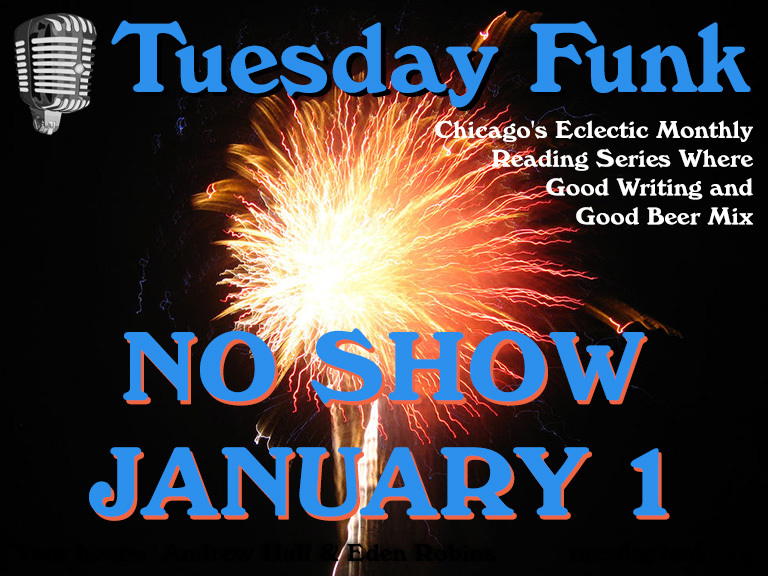 Tuesday Funk has been one of the most exciting and unpredictable reading series in Chicago since its founding in early 2008. We've featured wild-eyed poets, lark-tongued troubadours, and more excellent fiction, verse, and essays read live than you could shake a blue pencil at. I'm fortunate enough to have been asked to read for the series four times in the past couple of years myself, and I'm proud to have been considered an adjunct member of the Tuesday Funk family. Connor Coyne, Reinhardt Suarez and Hallie Palladino of the Gothic Funk Nation have run Tuesday Funk with scary efficiency since 2008. I'm very pleased and more than a little humbled to now be co-producing together with Sara Ross (whose entry into the family was announced in July). Sara and I hope to keep the same great mix of genres and disciplines that has made the series so much fun in the past, while throwing in some curve balls to keep things fresh and interesting. We have some big shoes to fill. Oh, another thing. 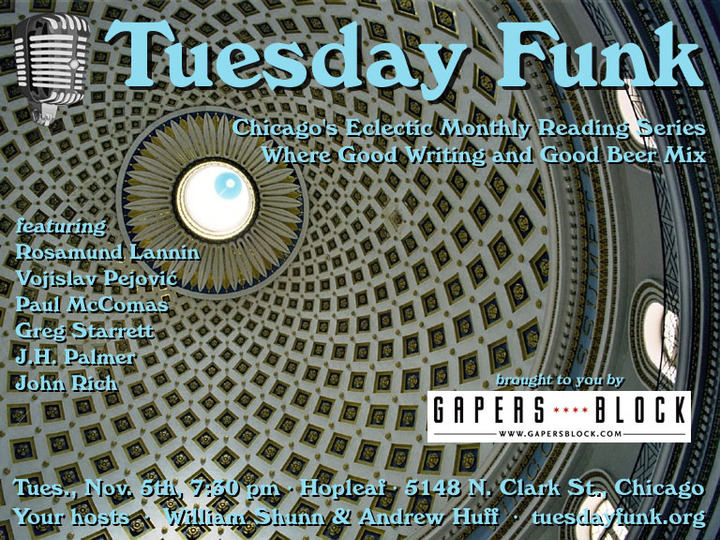 Chicagoans, please mark your calendars for our next reading on Tuesday, October 5, 7:30 pm, at Hopleaf. We'll have Jackie Adamski and Gothic Funk/Tuesday Funk founder Connor Coyne with us that night, and I'll be batting cleanup with my fifth appearance as a Tuesday Funk reader. But most importantly we need to keep our attendance high so we can continue using Hopleaf's upstairs bar month after month. More reminders will follow, but we hope to see you there. We also have a new Facebook page. Please drop by and "like" Tuesday Funk. And watch for Sara and me to tell you more about ourselves and our upcoming readers over the next several days. Finally, thanks to Hallie and Reinhardt and especially Connor for all their hard, often thankless work, for their continued input and advice, and for entrusting us with their baby. For all that things may be changing, and for all that we'll make mistakes along the way, we hope to keep the high quality of the Tuesday Funk the same. Thanks, Gothic Funk Nation, for letting us be citizens. This page is an archive of recent entries in the Notices category. Open Books is the next category.